A very effective way to keep your mailing list “warm” is to regularly send out an email campaign featuring the latest posts on your blog. Naturally, you can log in to your MailChimp account and manually send out an email campaign containing your latests posts but that’s far from optimal. 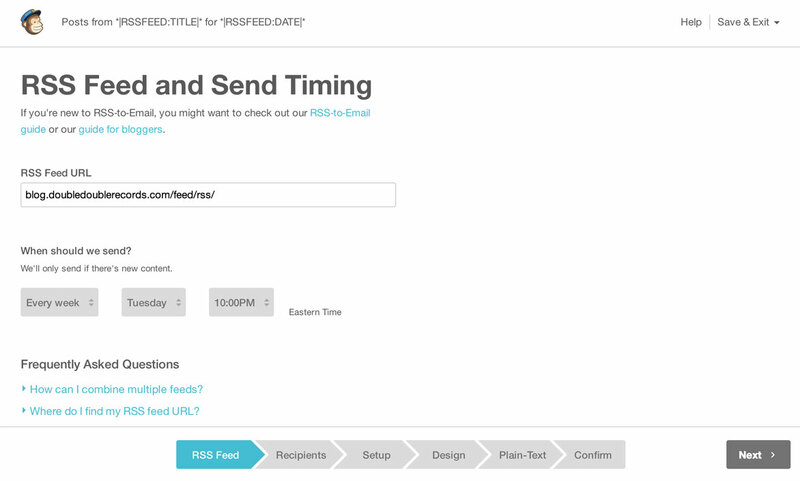 Luckily, MailChimp has a feature called “RSS to Email” that makes this far easier if you’re running WordPress. Using a so called RSS Driven Campaign you can have MailChimp check your site for new posts at a regular interval. If there are new posts, you can choose to send out a newsletter at a set time. The helpful people over at MailChimp put together a handy guide where they explain how to set up a RSS driven campaign step by step. That guide and your site URL is really all you need to setup a campaign that will automatically send your posts to the inboxes of your subscribers.